This chapter describes how we measured urban growth patterns in the three regions. Explaining how these methods work is important for two reasons. For the purposes of this project, a clear understanding of the analyses performed will help the reader interpret the results presented in Chapter 3. More generally, the use of uniform techniques to assess growth patterns over time in the same region or in different regions can help planners and policymakers compare outcomes to goals. Indeed, we hope that academics and planning professionals will adapt and extend these methods. To be accessible to non-specialists, this chapter describes the techniques in general terms. A more detailed technical explanation is found in Appendix A. Three techniques are described. First, we explain how we mapped the extent of urbanized land in the three cities. This involved processing and analysing satellite imagery for 1990 and 2001 for each region. Second, we describe our analysis of the cities' greenfield development patterns. We began by calculating the increase in the area of urbanized land over the decade relative to changes in population and dwelling units, as well as change in both the gross density of the urbanized area and the composition of the housing stock. These calculations were supplemented by an analysis that takes a closer look at the physical form of new urban development across the urban fringe using three landscape pattern metrics. Third, we describe our analysis of residential intensification in the cities. We mapped the locations of intensification -- that is, the dwellings constructed between 1991 and 2001 within the 1990 urbanized area. Then we used two spatial statistics to measure and identify whether these dwellings were clustered in certain locations. Finally, we compared the locations of clusters of intensification to downtowns and nodes designated for intensification in planning documents. 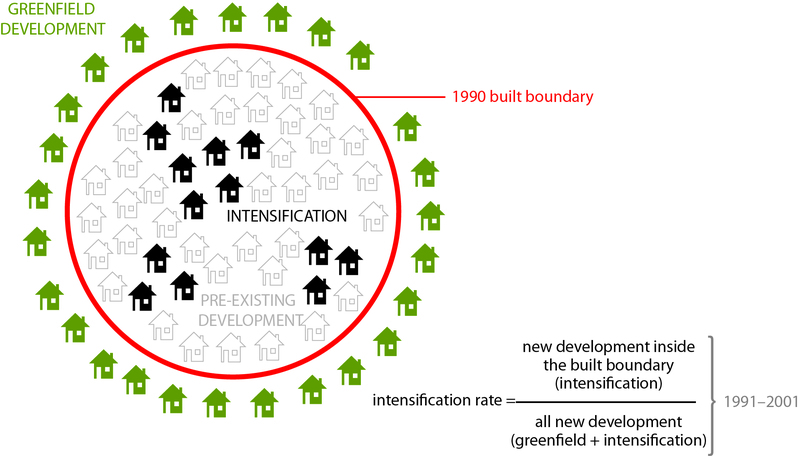 It should be noted that the greenfield and intensification analyses are focused on residential development. We do not explore changes in employment or other non-residential land uses beyond including them in the net increase in urban land during the time period under study. Although the study describes the patterns of urban development in Toronto, Vancouver, and Calgary at the metropolitan scale, a submetropolitan analysis was also included to better understand variation in urban growth patterns within each region. This chapter concludes with an explanation of how and why each region was divided into three zones for the submetropolitan analysis, representing different historical periods of urban development. In recent years, remote sensing data has been increasingly used to monitor changes in human activities marked by physical changes on the Earth's surface (Mesev, 2003; Schneider et al., 2005; Zeng et al., 2005; Zhang & Guindon, 2006). These data provide comprehensive and consistent coverage of the earth's surface and are not subject to the limitations associated with aggregating geographic units from predefined levels of geography, as is the case with census or other surveyed data. The limiting factor of remotely sensed data is its spatial resolution, or the level of detail captured by a single pixel in an image. Remotely sensed data are most useful when the spatial resolution of the imagery is consistent with the scale of the phenomena under study -- in this case, urban development (Jacquin et al., 2008); in other words, the amount of detail available in the imagery suits the application of the data set derived from the imagery. Our objective was to produce an urban land base that could be used to compare urban growth patterns, using a specific set of measures, in multiple cities. In delineating the urban area, our focus was on capturing the consolidated urban area -- areas of contiguous or connected urban development -- while disregarding isolated houses and buildings in the surrounding rural areas. We define urban land in physical terms as a land cover type associated with built surfaces, also known as impervious surfaces (Schneider & Woodcock, 2008). Using this definition, large vegetated areas separating built areas are not considered urban land. These areas may include large municipal parks, conservation areas, and golf courses. Roads that are not surrounded by built areas and that act simply as connectors between built areas are also excluded from the land base, along with land that has been cleared for development, but not yet built upon. Finally, mature, large-lot rural residential areas were excluded from our urban land category. To define the urban land base for each region, we used Landsat 5 Thematic Mapper satellite imagery from 1990 and 2001. The images were analysed for spectral characteristics associated with impervious surfaces, a proxy for urban land. We assigned each pixel into one of three categories: (1) urban land, (2) unbuilt land (including greenlands, vegetation, agricultural and barren land), or (3) water. A pixel is classified as urban land if at least 50% of its area is covered by impervious surface (Huang et al., 2007; Schneider & Woodcock, 2008; Zeng et al., 2005). We also used image enhancement techniques to detect specific types of land cover. For example, a vegetation index was used to highlight the green areas in the image. Likewise, a textural measure was used to detect the edge of urban areas. As summarized in Figure 2.1, the method proceeds in three stages: (1) pre-processing of the imagery; (2) image analysis, classification, accuracy assessment; and (3) post-classification, or editing of the land cover data. The first two stages are typical of image processing approaches. The automated nature of the first two stages can result in misclassifications -- hence the need for human intervention to correct them in the third stage (Guindon & Zhang, 2005; Schneider et al., 2005). Adapted from Du et al. (2007). In the third stage, the urban land base was modified to exclude stray pixels that may be a result of misclassification. For example, individual pixels or groups of pixels classified as urban that were located far from larger urban patches were removed, as well as isolated road segments that were not adjacent to an urban patch. Misclassification can also occur because some non-urban land uses exhibit spectral characteristics that are similar to some urban uses. For example, fallow agricultural fields or open pits and quarries may appear similar to large parking lots or industrial facilities. In such cases, we differentiated urban from non-urban land covers by examining their size and proximity to other large urban areas. 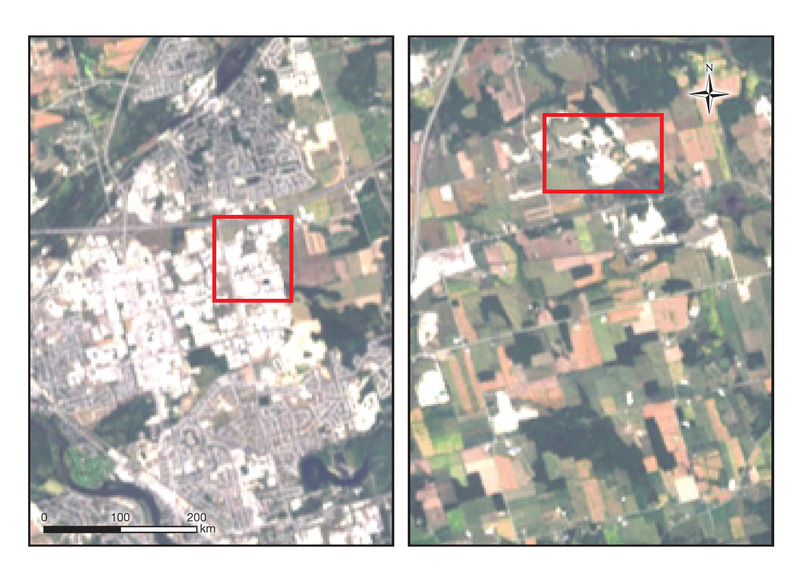 Figure 2.2 provides an illustration: an urban industrial area in the left-hand image has similar spectral characteristics to the quarry on the right. Although the science of image analysis has advanced in recent years, several challenges remain in correctly interpreting and classifying image data. First, the spectral characteristics of pixels representing a certain land cover may vary between images that have been captured on different dates, even though the land cover may not have changed. Variation can be caused by seasonal changes (leafy, green trees in the height of summer versus barren trees in the fall), or differences in weather patterns (a cloudy day versus a clear day), air quality (haze or smog), or ground conditions (wet or dry) on the date of capture. For comparative studies, it is important to use imagery captured at the same time of year and to choose imagery with ideal atmospheric conditions (cloud- and smog-free). Second, the area covered by a pixel can include a number of land covers without any one predominating. This is known as the mixed pixel effect. This effect can make it difficult to capture, for example, areas of very low-density housing that are disconnected from the contiguous urbanized area. In this case, the proportion of impervious surface to vegetated land cover (trees and lawn) makes it difficult to classify these areas as urban. The industrial area in the left-hand image exhibits similar spectral characteristics to non-urban pit and quarry operation on the right. As we noted in Chapter 1, the binary division of a metropolitan region into urban and non-urban zones may seem simplistic, given the complexities of the urban environment. Some uses of land are not easily assigned to one category or the other. Consider, for example, isolated residential clusters of development embedded in agricultural areas or in "strip" housing along rural highways. These developments are part of an intermediate or rurban zone with characteristics of both urban and rural development (Hardwick, 1974; Hugo, Champion, & Lattes, 2003; Lacour & Puissant, 2007). Using the same type of imagery employed in our study, some researchers have attempted to include these areas in estimates of urban land by creating arbitrary buffers around isolated "urban" pixels in the countryside areas of a metropolitan region (Zhang & Guindon, 2005). This approach may artificially inflate the extent of the urban land base by classifying more land as urban than actually exists surrounding isolated settlements or treating misclassified rural pixels as isolated urban land. We have tried to balance two competing requirements: using common criteria for all three cases and customizing each case's urban land base to its particular conditions. Although scattered exurban developments comprise a small proportion of the total housing stock in these three regions, this may not be the case in other places. Indeed, American observers have identified scattered, exurban development as a substantial and fast-growing segment of housing construction in the United States (Theobald, 2001). Rather than risk inflating our urban land base, however, we decided to use common criteria to exclude these developments (Wolman, 2005). This approach was also used by Metro Vancouver (2001), which does not consider rural residential or infrastructure-related land uses as urban land cover. Since many of the findings reported in Chapter 3 are closely tied to the way we define and measure the urban area, it is important to understand how this was done. As alluded to in Chapter 1, a metropolitan area is a complex mosaic of urban and non-urban land. Not surprisingly, the first product of our image analysis was a "Swiss cheese" version of the urban area -- the urbanized area within which a number of holes represent non-urban land uses such as large parks, ravines, conservation areas, etc. In a second step, we filled in these holes to create a continuous urban area as a second data set. Both data sets are used to calculate the results described in Chapter 3. The "Swiss cheese" version of our urban land base was used in calculations where area matters, for example, in measuring the increase in the amount of urbanized land, as well as density. The continuous urban area was used for analyses that integrate census geography, for example, when selecting census geographical units that overlap the urban land base. For an illustration of the differences between the two data sets, see Appendix A. One of the most fundamental measures of urbanization is the rate at which new urban land is added to urban regions over time -- that is, the rate of conversion of land from rural to urban uses. For the purposes of the analysis, we define greenfield development as land converted to urban use between 1990 and 2001 and located outside the 1990 urban land base. For each region, we mapped a 1990 and 2001 land base using our results from the image analysis. This allowed us to overlay the 2001 urban land base on the 1990 one, measure the areal difference between the two land bases, and calculate the percentage increase. One simple method for determining how efficiently land is being used is to determine whether the rate of growth of the urban area exceeds the rate of growth in population or dwelling units. Some researchers use this measure to establish whether a region is "sprawling" or not (Ewing et al., 2002; Fulton et al., 2001; Galster et al., 2001). To this end, we collected population, dwelling counts, and housing composition statistics for the two census years that most closely matched the years of our land bases, 1991 and 2001, and then compared the increase in urban land area to the increase in population and dwellings. Comparing population growth to dwelling unit growth indicates change in average household size for each region at each time period. This sheds light on the long-term demographic trend in western societies toward smaller households. As average household size shrinks, a portion of new housing production is "soaked up" by the existing population rather than used to accommodate new residents, such as in-migrants. We also compared each region's housing stock composition -- the proportion of detached housing versus low-rise attached, or apartments -- in 1991 and 2001. This provides another indication of change over time in metropolitan urban form. In addition to the traditional statistics described above, we used three landscape pattern metrics to describe the spatial pattern of new development. These metrics were first developed in the field of landscape ecology to examine the fragmentation of habitats in the natural environment, but recently they have been adopted by urban remote sensing and urban ecology researchers to conduct sophisticated assessments of changes in urban development patterns (Huang & Sellers, 2008; O'Neill et al., 1988, Rashed, 2008; Schneider & Woodcock, 2008; Zeng et al., 2005). Alberti (2008) used landscape pattern metrics to identify distinctive "urban landscape signatures" as measured by form, density, heterogeneity (the variability of land cover type), and connectivity. Rather than examining the entire landscape, our analysis focused on new development at the urban fringe. In this analysis, the urban fringe is defined as land within four kilometres of the edge of the 1990 urban land base. For all three regions, almost all greenfield development that occurred between 1991 and 2001 was in this area. The goal was to describe through quantitative techniques the pattern in which each region's urbanized area grew. Was new development adjacent to or disconnected from earlier development? Was it compact or fragmented? Did growth occur in a contiguous or leapfrog manner? In order to understand the pattern of urban development on the edge of the 1990 urban land base, we divided the urban fringe area into a series of equidistant bands (see Figure 2.3). Using a similar approach, Gar-on Yeh (2001) and Schneider et al. (2005) observed that cities with different growth rates had different patterns of urban fringe development. Our first metric, urban land density, allows us to describe the composition of the urban fringe. To measure it, we divided the urban fringe area into 16 bands and measured the proportion of the 2001 urban land base to non-urban land available for development within each band. This allows us to understand how the amount of new development changed across the urban fringe and whether new development is occurring nearer to or further away from the edge of the 1990 urban land base. Our two additional landscape pattern metrics were based on an urban patch analysis and describe the configuration of the new development. For these metrics, we aggregated the 16 bands into four super-bands and measured the number of discrete urban areas -- or urban patches as they are often referred to in the urban ecology literature -- in each of the four super-bands. In order to account for differences in size among the three regions, we expressed this measure as the percentage of urban patches in each band to all urban patches in the fringe area. In addition, we also measured the average size of urban patches (in hectares) within each super-band. Both metrics help us to understand variation in the form of new development across the urban fringe and the degree to which development is fragmented or not. Used together, these landscape pattern metrics shed light on the degree to which development at the urban fringe is contiguous, fragmented, or dispersed. For example, if new development is occurring in a relatively contiguous pattern, we would expect urban land density values to be higher in the bands closer to the 1990 urban land base, and lower in those bands farther away. Higher urban land density values in outlying bands, by comparison, may be evidence of a leapfrog style of development. Additionally, if a large number of small urban patches is distributed evenly across the landscape, this may be evidence that new development is occurring in a fragmented pattern. Alternatively, development may take the form of a few large patches located mainly near the 1990 urban edge. This may be evidence that development is restricted to large subdivisions. For more details on the urban fringe analysis, see Appendix A. Although other researchers have used remote sensing data and geospatial techniques to study the outward growth of urban areas, relatively few studies have used these data and technology to study the intensification of areas that are already urbanized. For example, Burchfield et al. (2006) conducted a land use analysis that identified infilling as a significant form of growth in compact cities in the United States. Schneider et al. (2005) explored the use of spatial analysis to study patterns of infilling and outward growth in the Chinese City of Chengdu, while Holloway and Bunker (2003) considered its application to understanding the impact of planning initiatives on patterns of intensification in New South Wales, Australia. In this study, we measured change in the way people occupy existing urban areas in three ways. First, we compared gross population and dwelling unit density on urban land. Second, we estimated the residential intensification rate for the period between 1991 and 2001. Third, we used spatial statistics to test the degree to which intensification was clustered and if it was clustering in locations designated in planning documents. We measured gross population and dwelling unit densities for the urban land bases in each region for 1990 and 2001. Comparing densities for the two years indicates whether development activity in existing urban areas over the decade was sufficient to increase the density of each region's overall urban area. We define the residential intensification rate as the number of newly constructed dwelling units built within the existing urbanized area, during a given period, relative to the total number of dwelling units constructed in all locations in the same jurisdiction. In this study, residential intensification rates for each region were determined by estimating the number of dwelling units constructed within the 1990 urbanized area land base between 1991 and 2001 (see Figure 2.4). The next step was to map the location of intensification. We also counted and mapped dwelling units constructed within downtown or nodal policy areas designated in municipal plans. In addition to mapping the location of intensification, we calculated the degree to which development was clustered. This approach builds on the work of Tsai (2005), who examined the effectiveness of several spatial statistics in characterizing four dimensions of metropolitan form: size, density, degree to which development is clustered, and the degree to which development is equally spread or distributed. Tsai used the statistical calculation known as Moran's I to determine the degree to which urban growth is compact. Brody et al. (2005) also used a combination of spatial statistical techniques -- the local indicator of spatial autocorrelation (LISA) and spatial regression -- to measure the degree to which development in south Florida conformed to the original design of adopted land use plans by clustering in areas designated for development versus protected lands, such as wetlands. Like Tsai (2005), we used the spatial statistic Moran's I to determine the degree to which intensification is clustered in a region as a whole. In other words, is development grouped in certain locations or is it dispersed evenly throughout a region? In technical terms, Moran's I is a measure of global spatial autocorrelation -- an indication of whether similar values of a particular variable are closer together in space (Getis, 2008; Moran, 1948). Values of Moran's I range from -1 to +1. A value of close to ?1, indicates an evenly distributed pattern; whereas a value closer to +1 indicates significant clustering. A value of 0 indicates a random spatial distribution. In addition, we calculated the LISA statistic. LISA stands for "local indicator of spatial association." It is based on Moran's I, but it is measured locally rather than a summary value of the regional pattern (Anselin, 1995). LISA is used to identify "hot spots" of clustering of high intensification values. These hot spots are mapped and compared to nodes designated in planning documents to see whether there is a relationship between them. The analyses so far have examined the metropolitan region as a whole. In order to understand variation in growth patterns within the region, we also conducted a submetropolitan analysis. Each region is divided into three zones that roughly correspond to the time periods in which they were predominantly developed: (1) the Core Areas built before 1951, (2) the Older Suburbs built in the 1950s and 1960s, and (3) the Newer Suburbs built after 1971. 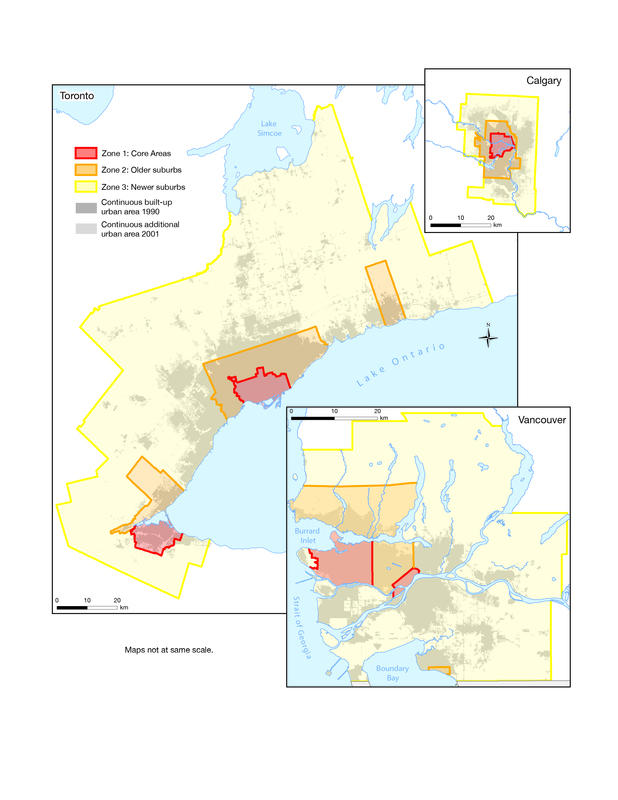 In Vancouver and Toronto, the three zones are made up of census subdivisions (CSDs), which generally coincide with municipal boundaries. CSDs were assigned to zones using two criteria. First, we consulted historical census data (back to 1921 in Toronto and 1941 in Vancouver) to determine the year in which CSDs reached their peak population. Second, we looked at the census "period of construction" variable, which indicates the proportion of the total housing stock in 2001 that was constructed in particular time periods: before 1946, 1946-60, and each decade thereafter. This enabled us to determine when the bulk of the housing stock was constructed. This procedure was based on a similar approach used by Taylor and van Nostrand (2008). Since the City of Calgary is itself a single census subdivision, we could not apply the same historical population analysis. Instead, we used several sources to define the zone boundaries. We began by overlaying four maps: one showing the progressive annexation over time of surrounding territory to the City of Calgary (City of Calgary, 2007a), two others showing concentric bands of urban growth (City of Calgary, 2007b:2; Sandalack et al., 2006), and a third showing the City's planning areas (City of Calgary, 1998:37). These were then overlaid with 2001 census period of construction data at the dissemination area (DA) scale. DAs were assigned to the three zones based on a combination of this information. Figure 2.5 illustrates the final configuration of the zones for each region. Table 2.1 summarizes the historical population peak and predominant period of construction for each zone. Using data on population and period of dwelling construction was useful for Toronto and Vancouver, because intensification often takes place through the demolition of existing housing stock. Extensive redevelopment replaces older housing with newer housing, making older areas appear "newer" in the period of construction data. This explains why the period of construction percentages for the Core Areas and Older Suburbs are skewed toward the present, while the peak historical population growth values follow the expected pattern. 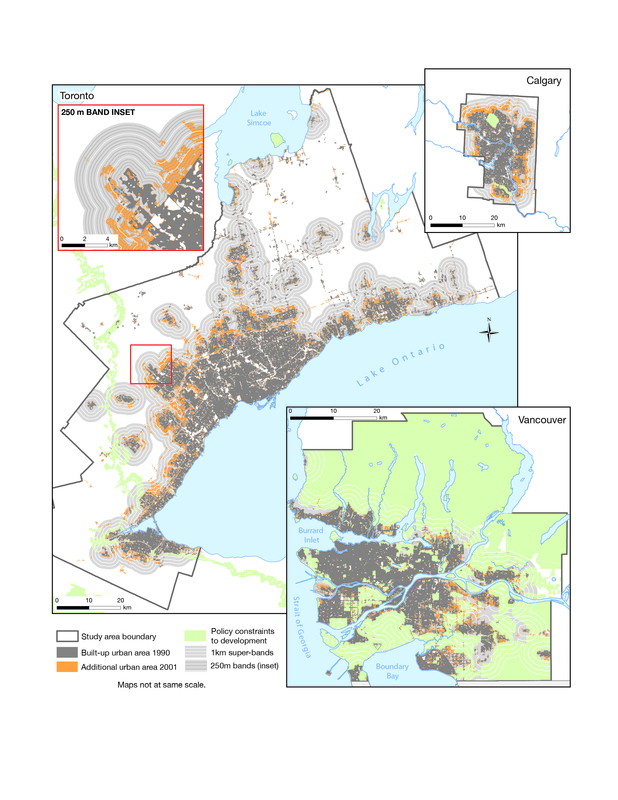 Once the zones were determined, we gathered population, dwelling, and housing type statistics for each zone from the 1991 and 2001 census survey. The statistics for each zone are extracted from a selection of census geography for both 1991 and 2001 that represent the urban population in each zone (see Appendix A for details on the selection process). For this reason, totals for population, dwellings, and housing composition in the submetropolitan analysis are not consistent with totals summed for each region as a whole. With the exception of the urban fringe analysis, all findings in Chapter 3 are reported at both the metropolitan and submetropolitan scales. a. ncrement = net increase in population, including births, deaths, and in- and out-migration. Table 2.2 summarizes the measurements described in this chapter and the scale at which they are measured. 1. The method used to define the urban land base in Toronto is described in detail in Du et al. (2007). 2. For a technical description of the method, see Burchfield et al. (2007). 3. Cleared, but undeveloped land was found to be abundant in the 1990 imagery for Toronto, as well as the 2001 imagery for Calgary. We speculate that in Toronto, these areas represent projects that were halted due to the economic slowdown in the early 1990s. The opposite is true for Calgary in 2001, an economic boom year. We speculate that in Calgary, land was being cleared faster than it was being developed, primarily due to a labour shortage in Alberta at the time. To avoid inflating the estimate of residential intensification, this category of land is excluded from the urban land base. 4. The dimensions of each image pixel in the Landsat imagery are 30 metres by 30 metres, or 900 m2. 5. In Toronto, more than 97% of greenfield development occurred within four kilometres of the 1990 urban land base. In Vancouver and Calgary, the figures were approximately 99%. 6. This definition is derived from the Ontario government policy on intensification, which stipulates that a certain proportion of all new residential development for a certain time period must be directed to the already urbanized area. See Growth Plan for the Greater Golden Horseshoe (Ontario, 2006), s. 2.2.3. Other jurisdictions are adopting measurement tools that encourage a strict division between urban and rural land uses in the regional landscape. Metro Vancouver calculates intensification using a similar method, but relied on "historic planning boundaries, property development records and land use density calculations" to derive urban land bases for the years 1981, 1991, and 2001 (GVRD, 2007). 7. For the Toronto region, this meant collecting information for municipal boundaries as they were configured prior to the 1998 amalgamation of the City of Toronto and the 2001 amalgamation of the City of Hamilton. 8. CSD boundaries have been stable in Vancouver since 1941. In Toronto, however, episodes of municipal restructuring in the 1960s and 1970s changed CSD boundaries in significant ways. This led to a more selective approach to zone creation that was informed by the authors' knowledge of Toronto's urban development history. For this reason, the "newer suburbs" cells in Table 2.1 are blank for Toronto.